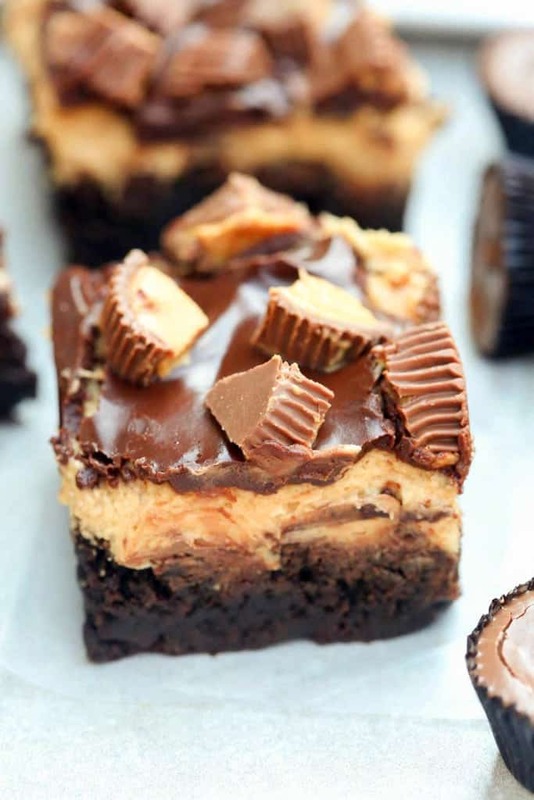 Reese’s Peanut Butter Brownies are chewy homemade brownies with an amazing smooth peanut butter frosting topped with chocolate glaze and mini reese’s cups. 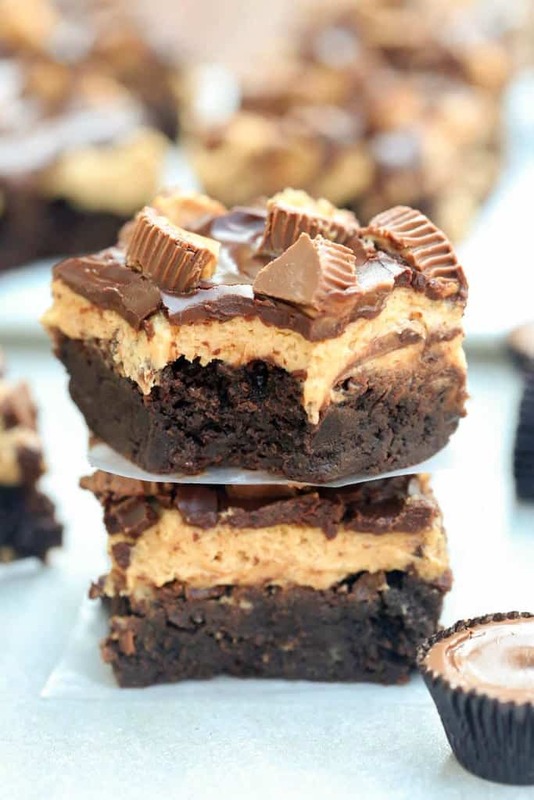 These Peanut Butter Brownies are just as amazing as they look. I like to make them 1 day in advance because I think they taste even better after the brownies have had time to cool in the fridge. Or, if you want to save prep time, you could make the brownies a day in advance and then frost them the next day. You can’t beat the peanut butter/chocolate combo, can you? Hopefully these completely satisfy your sweet tooth! 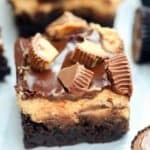 Reese's Peanut Butter Brownies are chewy homemade brownies with an amazing smooth peanut butter frosting topped with chocolate glaze and mini reese's cups. In a mixing bowl add granulated and brown sugars and melted butter. Beat until well combined. Add eggs and egg yolk, beating after each addition. Add milk and vanilla extract. In a separate bowl mix together the flour, cocoa powder, baking powder, and salt. Add dry ingredients to wet ingredients and mix just until combined. The batter will be thick. Pour batter into a greased 9x13'' baking pan and spread into an even layer. Bake at 350 degrees for 35-45 minutes or until a toothpick inserted in the center comes out clean. Allow to cool completely. Beat together butter, and peanut butter until smooth. Add milk, beating well until light and fluffy. (Add more milk or powdered sugar if needed to make the frosting thicker or thinner). Smooth frosting over the top of brownies. Refrigerate while you make the chocolate topping. Place chocolate chips and butter in a microwave safe bowl. Microwave in 30 second intervals, stirring in between, until just melted and smooth. Allow to cool for 3-4 minutes. Spread evenly over the frosted brownies. Add chopped reese's chocolate to the top. Return to fridge to allow the chocolate to harden. Cut into squares and serve! Made these for a family get together. We all love peanut butter and chocolate. They turned out great. One of my favorites now. I don’t suppose you have the recipe conversion in grams (sorry UK) I have checked the conversion rate on a few different websites and they all give variation! want to do your recipe justice! Hi. For frosting and glaze do we use salted butter or unsalted? Thank you.